…On All Lacquered Up’s fantabulous blog. 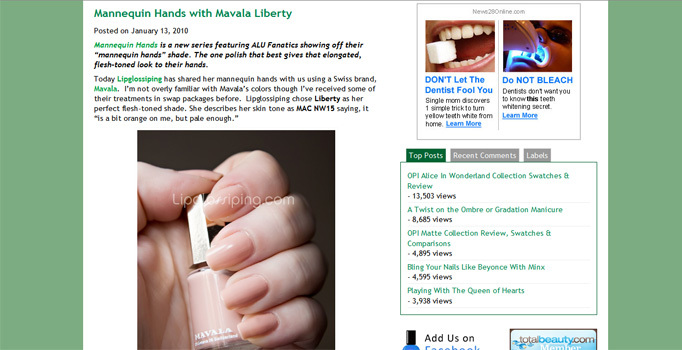 I submitted my favourite “mannequin hands” polish and got featured – whoop! Only other sad bastards will know how exciting this is, so if you don’t ‘get it’ – it’s ok, you’re officially cool. If you do… I’m sorry, there must be a support group out there for us somewhere right? If my nails were as lovely as yours, I’d be touching everything the way the models do on programmes like Family Fortunes. Your nails are growing in beautifully! Nice feature, too. Found your blog through ALU after the mannequin hands feature (and got hooked on your archives! )… dude, I would totally be doing my nerdy celebration dance too. Fab nails. Haha… thats so cool!!!! Im one of the sad bastards that went though all the mannequin hands post on ALU. Ive become quite obsessed with them lately. i’d be sooo excited if that was me.